The plane at the Quad Cities airport was an hour late Monday evening, but it didn't dampen the spirits of several hundred people who were waiting in Galesburg to welcome the last of the 123rd National Guard Field Artillery home. Among those last 25 returning from Iraq was Kale Burgdorf, formerly of Media, now living with his wife Heather in La Harpe. "It was wonderful!" Connie Burgdorf said, with the first sound of excitement she has had in her voice since both her boys were activated for duty over a year ago. "Cars lined the route all the way to Galesburg. Horns and sirens sounded, people were waving flags, there were lots of hugs, it was a wonderful welcome" she said. Each soldier was given a rose when they got off the bus and the soldiers were lined up for less than a five minute welcome and dismissal by their commander. Kale's whole family was there and there were not many dry eyes. "I just can't believe I'm home. It's like a dream!" Kale said after his 14 month stay in Iraq. "The news media make it out to be worse than it is." "Don't get me wrong. It was bad, but it doesn't even compare to Vietnam." Kale said that "people shoot and run, or strap something to a car and blow it up. You heard gun shots and things blowing up, but it wasn't all the time." Kale heard stuff blowing up everyday the first 6 months, then it slowed down. Kale listened to his officers and did what he was told. His company didn't have anyone killed but he knew soldiers that lost their lives. "There is no amount of training that can really prepare you for what you are going to be doing there. We take a lot of things for granted, like TV, Internet. Those people never had that. They would never throw anything away but try to fix it. They constantly were going through the garbage. Kale was able to sleep at night and lucky enough to live in a building and have bunk beds. "They were too short but better than cots or the ground, and we had hot meals," he said. The cooking was contracted by the KBR and "they can't cook chicken or even spaghetti," Kale said. Their cooks were from India. "A couple things I didn't know was how hot it really was going to be there," Kale said, " or where we were going and what we would be doing there." Upon arrival, "we slept on the ground at the Iraqi National Airport waiting on choppers that never showed so we went in a gun truck the next day," Kale said. His group was trained by the unit they were replacing. "I was a mechanic and replaced engines, fixed steering problems, and got Humvees working again. It was routine and boring, but necessary," Kale said. Kale and his brother were together until Chris's unit was moved a 30 minute drive away. "It doesn't sound far," Kale said, "but the route to his place was called "IED Alley" one of the worst roads to drive on in Iraq." He said an IED is a bomb they basically dig a hole and put a cell phone to it and when they call it, it blows up. He told of other bombs, saying "It's a big eye opener. "Before I left, I was a little kid and didn't take a lot of stuff real serious. I didn't think something like this could happen to me. One day you get a phone call and told you are mobilized. You grow up on that one. Then you see things you don't want to see and you are 9,000 miles from home. Problems back home you just can't deal with, you just got to grow up and say this is real life now. You take one day at a time. Kale said it is an adjustment at home. "I was in the same group for 14 months. All those guys aren't around no more. What do I do? It doesn't seem real yet." Kale said here, he drove to the city and he rushed around on the streets and found it frustrating because there are things you look for when you drive in Iraq. "You catch yourself looking, running stop signs, zipping through traffic. You can't do that here. It is frustrating." I woke up two or three times in the night last night asking, "where am I?' It isn't dusty and smelly, there is hot water, hot meals, American cigarettes:you pick up some bad habits when you are gone. Kale said he is happy to be home. In Iraq he had signed up again for another 6 years with the National Guard. "I'll be ready if they call again," he said. "But not right away." Kale said he really enjoyed getting the Quill while in Iraq and liked seeing familiar faces and reading the Meet Your Neighbors each week. Now he returns to his wife Heather Brissey who he married June 6, 2004. He has 3 months before he is required to be back at work, but said, he will be getting back to his job at Winegards in Burlington, by the end of the month. 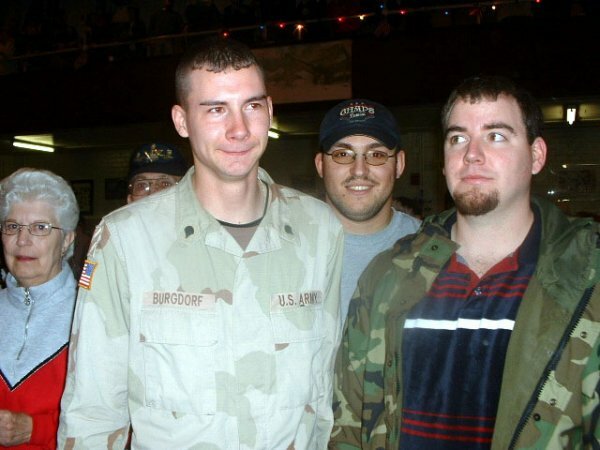 Kale and Chris Burgdorf, Southern graduates, now of La Harpe, experiencing the emotions of a brother's homecoming from Iraq Monday evening after the last unit of the 123rd National Guard arrived in Galesburg.